Prominent & Leading Manufacturer from Jaipur, we offer women long skirts, cotton skirt, long skirts, printed skirt, dabu indigo printed skirt and hand block printed skirt. 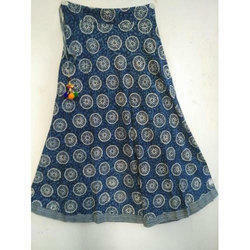 Keeping the track of latest market trends in mind, we offer the high quality Women Long Skirts. It is ideal as causal Womens wear during hot and humid summer of India. It is also available in various colors and designs to meet the precise needs of our customers. Years of understanding of this domain has helped us in presenting the superior quality of Cotton Skirt. It is ideal as summer wear due to its skin-friendly fabric. 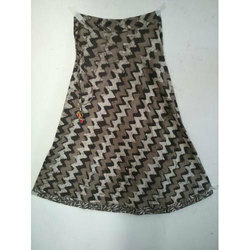 Made as per latest fashion trends, it is available with us in various sizes and color options. We offer the causal Long Skirts in various colors and sizes for women. For designing these products as per latest market trends, we make use of skilled craftsmen and experienced tailors. The quality of the offered products is unmatched due to our rigorous quality assurance procedures followed from procurement of the raw fabrics till the final dispatch. Motivated to meet the precise needs of our customers, we offer the Printed Skirt in various colors. Easy to wash and comfortable to wear skirts are ideal for casual wear in college or office. It is checked by a team of quality controllers for ensuring a defect-free range. 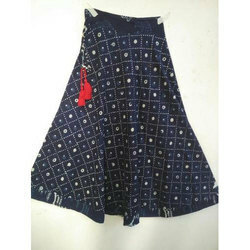 Best quality Dabu Indigo Printed Skirt in varied sizes and color combinations are offered to our customers at reasonable prices. Experienced craftsmen design these as per latest market trends. It is known for its alluring design and trendy appearance.